This morning RIA Novosti reported on a familiar topic — the conflict between planned acquisition embodied in the State Program of Armaments, 2011-2020, and the Russian OPK’s capacity and capability to deliver it. 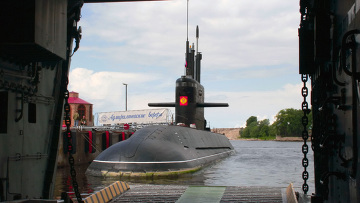 In this case, new diesel-electric submarines from St. Petersburg’s Admiralty Wharves. Also familiar is one reason for the bind — a lingering priority on production for sale abroad. RIA Novosti notes “Krasnoye Sormovo” built plenty of Soviet submarines, 280 in all, including 25 nuclear-powered ones. Its last boat was a diesel-electric for China in 2005. The plant also outfits Russian Navy and export subs with torpedo- and mast-related equipment. The article also speculates that construction of French-designed Mistral helicopter carriers could be problematic if Admiralty is selected. The shipyard is reportedly planning on new construction space on Kronshtadt for this reason. The OPK source says Mistral would be Admiralty’s main concern, and occupy its main capacity and personnel. So, he continues, it’s logical to send some orders (i.e. submarines) to other factories that have the capabilities. RIA Novosti notes rather dryly along the way that no Russian GPV has been fulfilled completely because of the country’s insufficient modern industrial capacity. One wonders what, if any, work and investment would be required to bring “Krasnoye Sormovo” and Amur back into the sub-building business. This entry was posted in Arms Sales, Defense Industry, Force Modernization, Naval Modernization and tagged Admiralty Wharves, Arms Exports, GPV 2011-2020, Indonesia, Krasnoye Sormovo, Kronshtadt, Mistral, OPK, Submarines, Venezuela, Vietnam. Bookmark the permalink. is it really true there is new signed contract of sub with indonesia?